Another post from Bronwyn this week? So soon? Yes! Mainly because I recently found a journal entry from exactly six years ago today which highlights some of the music I was obsessed with at the time. So it seemed like a good time to share it with you. You’ll notice it’s a little… link-intensive, shall we say. Well, instead of embedding a dozen videos in the post, I’ve just included links to the best recordings of things that I can find on YouTube. I don’t expect you’ll want to click on them all (at least, not all in one sitting!) but these are some fabulous pieces which still stand out as favourites among all the things I’ve performed over the years. Although I’m yet to sing all of the Lux Aeterna with a choir (just the ‘O Nata Lux’ so far). Maybe one day. I have to add that I’ve loved compiling this post as well, because it’s given me an excuse to listen to some things I haven’t heard for a while. It’s like catching up with old friends! There’s probably an hour of music listening to be had here – more, if you seek out the rest of the Rheinberger Mass and the Howells Requiem – but space it out over the week and it will keep you going until I post again. Enjoy! Every now and then I have a day or two where I like to completely immerse myself in some new piece of music I’ve discovered, listen to it until I know it backwards – every nuance, every spine-tingling moment, every delicious chord or yummy dissonance. I haven’t quite had a chance to do that yet with Morten Lauridsen’s Lux Aeterna, but I will in time. Yesterday was our first Concordis rehearsal for the year and by happy coincidence I also received the two CDs in the mail that I won on eBay last week, one a compilation of things by the Robert Shaw Festival Singers, and the other is a CD of work by Morten Lauridsen recorded by the Nordic Chamber Choir and it’s simply stunning. Plus at rehearsal last night we looked at a couple of new Eric Whitacre pieces, so I’m rediscovering my love of that CD too. I love having these days where I just can’t get enough music – I listen at every opportunity and remind myself of a whole lot of music that has the power to take me to another world entirely. There are lots of things that can do it, depending on what mood I’m in, but I love discovering new things as well as reliving old favourites. I think I’ve become a lot more open-minded since joining NYCA – where would I be without having discovered Rheinberger’s Cantus Missae, or the Howells Requiem, or how much fun it is to sing Bach, or what it feels like to sing Stanford’s Beati Quorum Via just the way it’s meant to be sung, including capturing the lilting feel of it the way Noel wants it. Sometimes I am just struck spellbound by a piece of music and its warmth, or luminescence. It truly is one of the most important things in my life, and I wouldn’t trade anything for the experience of singing and listening to some of the world’s most powerful music. Nothing is quite as life-changing. I hope this book makes you laugh out loud in public spaces. Your laugh is your aria. I love you. About two weeks ago I went to the Lifeline Bookfest, an annual event which fills the Brisbane Convention Centre with probably several kilometres’ worth of secondhand books. These kinds of events are always a bit of a mixed bag, and although I came away with a few interesting finds, it was only after I trawled through endless Dan Browns and Bryce Courtenays. On the dubiously categorised ‘music & art’ tables I had to sift through numerous celebrity biographies of people like Sting and Miley Cyrus, and book tie-ins from once-popular TV shows of the 90s like the X Files. But my effort was eventually rewarded when I came across a gem of a book called Swooning: A classical music guide to life, love, lust and other follies by ABC broadcaster Christopher Lawrence. I’m a bit of a fan of the ‘Swoon’ segment on ABC Classic FM; I knew of this book but hadn’t read it, so I was delighted to find not just one but multiple copies of it buried among the chaff. And when I opened the front cover of one to reveal the handwritten inscription from Louise to her beloved, I knew this was the copy I had to own. Words about music for the novice can be had in what is called a ‘music appreciation’ course. This is such an awful term. Learning to ‘appreciate’ good music is a bit like learning to sift patiently through your spouse’s personality in search of the odd attractive feature in an arranged marriage. Of course many arranged marriages do work out, but only after the partners reach an accommodation with each other. These days we don’t have the luxury of twenty years in which to learn to accommodate a Beethoven symphony. What we’re really after is fulfilment with some romance and excitement along the way. This is as true of people as it is of symphonies, sonatas and operas. We’re not just encountering Beethoven; we’re meeting him on a blind date. First impressions mean a lot. Eventually one learns to look (or listen) beneath the surface to the goodness within, but it helps to have been just a little captivated over the first dinner. Yes! This is what classical music needs! We don’t need more studying: we need more dating. We need less musical analysis, and more getting to know composers by the fire with a glass of wine in hand. More secretive glances and flirting and seeing whether the composer we’re courting is willing to reciprocate with a spine-tingling chord or a lingering melody. More ‘canoodling’ behind the bike sheds with an mp3 player and the complete Bach motets. Hell, even more casual hook ups should be encouraged: downloading tracks or borrowing CDs with reckless abandon from the library (or the libraries of friends) and returning them when our wantonness has been satisfied. We wouldn’t be hurting anyone. Not even the inspired creators of the music we devour so frivolously. It’s funny, since beginning Swooning I’ve been thinking about what it would mean to go on a blind date with a composer. Actually, I’ve been thinking about dating generally, since this month I’m participating in a charity fundraiser called Five in Five which involves going on five dates in five weeks to raise money for people in urban poverty. And at this stage it’s just a theory, but I think there’s a lot to be said for approaching new music as you might approach a blind date, except that you don’t have to worry about the bit where you’re constantly focused on making a good first impression yourself. Instead you get to sit back and admire, assess what things immediately catch your attention, and consider whether you see a future between you and this unfamiliar composer. Maybe you’ll decide they’re not for you but you can still appreciate that you took the time to discover someone new. Maybe a piece will intrigue you enough to listen to it a few times but there the dalliance will end. Or maybe you’ll start a lifelong love affair that will still have the potential to surprise and delight you with every new work you discover. And the best bit about going on dates with composers? You don’t need to be monogamous. So in addition to my real life dating challenge, I’ve decided to set myself a musical dating challenge – go on a ‘blind date’ with five new composers to discover some new music, and report back here on my findings (probably just the musical ones, sorry!) The challenge is open to you too, if you like! Post a comment or send me an email to tell me about it. I thought I’d leave you with a piece that is probably as close as I come to having had a blind date with Beethoven himself. I honestly don’t remember when I discovered his music but it was a long time ago, certainly at some point while I was still at school. I knew snippets of several works without having ever really listened to them in depth, and once I could play the piano I would sometimes pick up the book of his sonatas and work my way through at random, attempting any passages that looked easy enough to note-bash my way through. The Moonlight sonata and the second movement of the Pathetique sonata are the two I remember most clearly. So I’m not sure I’d describe him as a childhood sweetheart exactly, but he certainly seemed to be a musical presence in my youth. And then last year I had an encounter that was surely the most breathtaking Beethoven moment of my life, when Camerata of St John’s played the Cavatina from his String Quartet No. 13 in a late night performance at the Cathedral. It was like time stood still; I may not have breathed for a full eight minutes. I’ve never been the biggest string quartet fan which is probably why I didn’t already know the work, but played by a small chamber orchestra it was like nothing I’d ever heard before and I couldn’t quite believe that a composer I thought I knew could have such a sudden and immediate affect on me. There’s a reason why this piece was chosen for the Voyager Golden Record and launched into space. Anyway, who knows what became of Sean and Louise, although I do hope they’re out there somewhere and still sharing a musical life together. I will continue to enjoy reading their book. I sort of agree. Except for the stupid part. I personally think writing about music, talking about music and thinking about music are all amazing things to do – it’s just that they are fundamentally different activities, with different purposes and outcomes and expressing different ideas. Of course, they can’t replace music itself. But then most people who write about music aren’t trying to. And there are some fantastic words about music floating around out there in the world. This week Music Tasting turns to fiction, for someone else’s words about music. 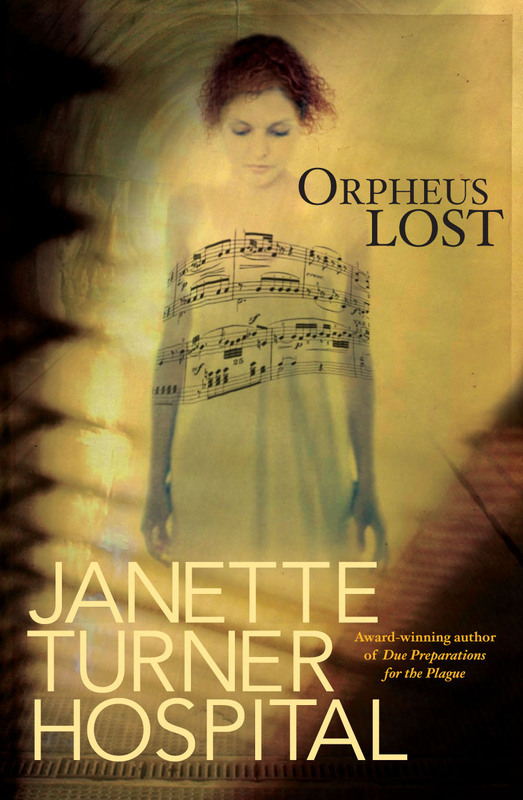 Orpheus Lost is by ex-pat Australian author Janette Turner Hospital, who has written several highly acclaimed books and numerous short stories and who also happens to be my mum’s cousin (just putting it out there, so you know – I had the pleasure of staying with her and her husband at their home in the US a few years ago). The novel is a contemporary twist on the Greek legend of Orpheus in the Underworld, and is a beautifully told story of Leela, a mathematician from the American South, and Mishka Bartok, a young Australian musician. A love story, but set against the complex backdrop of terrorism and paranoia, and infused with music and obsession. I highly recommend the whole book, but here’s an extract from the very first chapter, which completely and utterly drew me in from the beginning. The tunnel smelled of monstrous decay, but even so, even knowing within the dream that she should turn and flee back up into the sunlight, Leela would be powerless. Mishka’s music drugged her. Waking or sleeping, she could close her eyes and see him as she saw him that first time: not just the visual memory lurking entire, but the sounds, the sensations, the hurly-burly of Harvard Square, the slightly dank odor of the steps as she descended into the underworld of the Red Line, the click of tokens and turnstiles, the gust of fragrance from the flower sellers, the funky sweat of the homeless, the subdued roar of the trains, and then those haunting notes…. She stood riveted, her token poised above the slot in the turnstile. She had heard two bars, perhaps three, in the brief lull between trains. “Would you mind?” said someone behind her. “What? Oh… sorry.” She let the token fall through the slot. She pushed against the steel bar and into the space of the music. There was another pause between trains, a few bars, a stringed instrument, clearly, but also a tenor voice. Was it a cello that the singer was playing? Surely not. No street musician would cart such a large and unwieldy instrument down into the bowels of the city, onto the trains, among the crowds; but the sound seemed too soft for a violin, too husky, too throaty. She could feel the music graphing itself against her skin, her body calculating the frequencies and intervals of the whole subway symphony: base throb of trains, tenor voice, soft lament of the strings, a pleasing ratio of vibrations. Mathematical perfection made her weak at the knees. She was letting the music reel her in, following the thread of it, leaning into the perfect fifths. Crowds intruded, echoes teased her, tunnels bounced the sound off their walls—now the music seemed to be just ahead, now to the right—and two minutes in every five, the low thunder of the trains muffled all. The notes were faint, they were clear, they were gone, they were clear again: unbearably mournful and sweet. Leela was not the only one affected. People paused in the act of buying tokens. They looked up from newspapers. They turned their heads and scanned the walls and ceiling of the subway cavern for speakers. With one foot on the outbound train, a man was arrested by a phrase and stepped back out of the sliding doors. “Over there,” the man pointed. “Extraordinary,” the man said. He began to run. Leela followed him the length of the inbound platform to where a dense knot of commuters huddled. For a while the music was clearer as they approached, and then it was not, and then it seemed to be behind them again. Leela turned, disoriented. Her hands were shaking. The man who had stepped back from the outbound train leaned against a pillar with his eyes closed, rapt. Leela saw a woman surreptitiously wiping her sleeve across her eyes. The violin itself was weeping music. Sometimes it wept alone; sometimes the tenor voice sorrowed along with it in a tongue not quite known but intuitively understood. The singer was singing of loss, that much was certain, and the sorrow was passing from body to body like a low electrical charge. Leela recognized the melody, but although she could analyze the mathematical structure of any composition, she had trouble remembering titles of works and linking them to the right composers. It was an aria from some early opera, that much she knew. Gluck, probably. She had to hear all of it. Ahead of her was an impenetrable cordon of backs. Leela closed her eyes and pressed her hands to her face. She had a sense of floating underwater and the water was warm and moving fast and she was willing to be carried away by it. It was this way back in childhood in summer ponds in South Carolina, or on the jasmine-clotted Hamilton house veranda, or in deep grass, or lying under the pines with local boys; it was this way in later carnal adventures: body as fluid as soul. Everything was part of the euphoric storm surge which swept Leela up and rushed her toward something radiant that was just out of reach. A fist of air punched her in the small of her back and a tidal wave of announcements drowned the music. Her hair streamed straight out in front of her face like a pennant. Words rumbled like thunder. Stopping all stations to shshshsh clang clang for Green Line change at Park clang shshshshsh…. Bucking and pushing ahead of the in-rush of train, a hard balloon of air plowed through the knot of listeners and scattered them. That was when Leela caught her first glimpse of Mishka Bartok. His head was bent over his instrument, his eyes focused on his fingered chords and his bow. He was oblivious to the arrival of the train. His body merged with the music and swayed. He was slender and pale, his dark hair unruly. A small shock of curls fell down over his left eye. When he leaned into the dominant notes, the curls fell across the sounding board of the instrument and he tossed them back with a flick of his head. Leela thought of a racehorse. She thought of a faun. Incongruously, she also thought of a boy she had known in childhood, a boy named Cobb, a curious boy with a curious name, a boy who had been possessed of the same skittish intensity which somehow let you know that, if cornered, this was a creature who would not yield. The violin player had Cobb’s fierce and haunted eyes. There was no hat on the platform in front of him, no box, no can, no open violin case for donations, and the absence of any such receptacle seemed to bother the listeners. Someone tucked a folded bill into the side pocket of the violin player’s jeans but he appeared not to notice. A student in torn denim shorts took of his cloth hat and placed it beside the closed violin case as tribute and people threw in coins and placed dollar bills—ones, fives, tens even—in the hat but the musician seemed indifferent and unaware. Some listeners boarded the inbound train, some seemed incapable of moving. Leela let five trains come and go, bracing herself each time against the buffeting of air. She had now worked her way forward to the innermost circle. She was four feet from the man with the violin. She could feel the intensity of his body like a series of small seismic waves against her own. Trains arrived and departed, some people left but more gathered, the crowd around the main with the violin kept getting larger. His instrumental repertoire seemed inexhaustible—he barely paused between pieces—but when he sang, it was always and only when he cycled back to the same aria that had first reached Leela’s ears. When he sang, she could not take her eyes off his lips. She touched her own with the pads of her fingers. She had a sensation of falling forward, of free-falling into a well of melody without end. The cautionary words above her desk hovered at the edge of her mind: Obsession is its own heaven and its own hell, but she did not care if she stayed on the inbound platform all day. She wondered fleetingly if hours might have already passed. She gave herself to the wave of music. She wondered if she might have grown gills. Perhaps because she was now so close to him, perhaps because of the heat that her body gave off, the musician glanced up as he began to sing the aria again. Their eyes met. Something fizzed and smoldered like a lit fuse along the line of sight. Leela let less than one second pass as the last note faded, and then, recklessly, interposed herself between the player and his next chord. “What is that song?” she asked, or tried to ask, even as his bow hovered above a new beginning. There was a constriction in her chest. 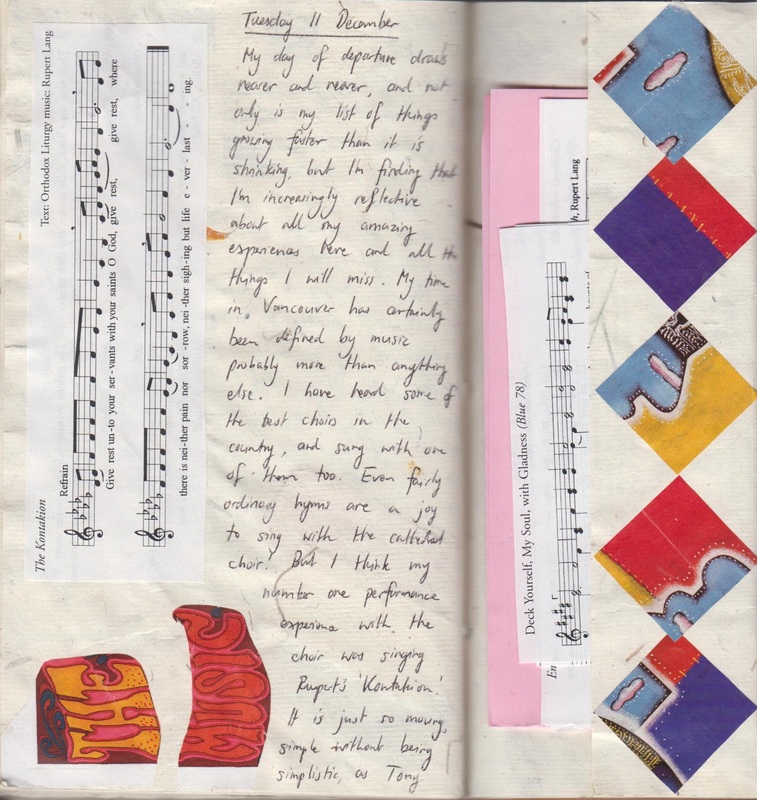 Pages 4-8 from Orpheus Lost by Janette Turner Hospital, published 2007 by Fourth Estate. Read the rest of it – I promise you it’s worth it. Last year before Fusion‘s November concert, I wrote a short article for the Music Council of Australia about ways to help audiences appreciate live classical music when listening to a programme of music that might be almost entirely unfamiliar. It was just for one of their weekly e-bulletins and thus the article itself was only online for a short time and didn’t reach a terribly wide readership, but it’s something I’ve been thinking about again recently so I’ve rewritten it slightly for the purposes of this blog. And in this format I’ve also been able to include the musical examples which I reference throughout the article. Trying new things comes naturally to some people. Others are more hesitant but may be persuaded once someone they trust gives them a hearty recommendation. Many will try new foods, travel to new places, see new films, and discover new authors, all with reckless abandon because they don’t think they have anything to lose. Classical music, on the other hand, can be a whole different story. Rarely are people so hesitant – even when they are already self-confessed lovers of classical music – as when they are invited to a concert of works they don’t already know. Mozart’s Requiem? It’s a full house. A programme of music by composers you haven’t heard of? Hmm. Suddenly going to a movie instead seems more appealing (and yet ironically, the chances are that you’d choose to see something you haven’t seen before). While there is a small percentage of music lovers who actively seek out new works by emerging composers and up-and-coming performers, musicians know that it is a constant struggle to entice audiences to classical concerts of all kinds. The struggle is amplified when we don’t expect the audience to already be familiar with the programme. And yet we also know that our growth as musicians, both personally and professionally, comes from expanding our knowledge and appreciation of music – and that means choosing to seek out the unfamiliar. Fusion is a vocal ensemble based in Brisbane and directed by Debra Shearer-Dirié. Their November 2012 season consisted of music from Spain and Latin America. Entitled Tapas, the concert was something of a ‘tasting plate’ of choral repertoire, from rich Mexican Baroque through to a lullaby arranged by a contemporary Venezuelan composer. To the best of my knowledge, none of it is repertoire which is performed frequently in Australia. Inspired by the theme of the concert, I began thinking about ways in which the metaphor could be a useful way to approach any performance of new or unfamiliar repertoire. If audiences need a helping hand to explore new music – and it would seem that sometimes they do – then perhaps a short ‘tasting guide’ is what’s needed. If you wish to gain something more from your next experience of listening to new music than you get currently, then below are three elements you could consider. For each of them there is a repertoire example from Fusion’s Tapas programme, but the concepts could easily be applied to almost any music, live or recorded. First of all, consider the component parts of the music. In the same way that you would judge a meal by its ingredients, notice what’s in the music, and what’s happening. Notice voices, instruments and how they interact. Think about the texture – is it sparse, dense, or somewhere in between? Who or what stands out, and does this change? Pick one or two things that you make a point of listening out for, like a particular instrument or voice, just as you might do when you concentrate on a mouthful to see if you can identify a flavour. Francisco Guerrero – Ave virgo sanctissima: The two soprano parts are in canon four bars apart for the duration of the piece. Listen to the dialogue between them, and how the sound changes with the movement of the lower voices. We all know that what food looks like plays a part in how appetising it is – a well plated dish is visually enticing, and we often assess food’s appeal by its colour. This is harder to do with music of course, when you need to rely on information primarily received aurally. But you can still ask yourself what mental pictures it creates for you. What does the music look like? What colour is it? What words or images do you find yourself imagining? Is it a still lake with barely a ripple on the surface, or is it a blur of movement so frantic you can’t keep up? Diego José de Salazar – Salga el torillo hosquillo: This vibrant piece from 17th century Spain depicts a bullfight and is full of movement and excitement. Create a movie in your head while you listen, and focus on the colours, images, words or other sounds that come to mind. Food and music are both deeply connected to emotion: both are involved whenever we celebrate, and we often turn to both for comfort. Music doesn’t have to be analysed on a cerebral level to be appreciated. What does it make you feel or think about? Who, where or what does it remind you of? Just sitting with the feelings that the music provokes, even unpleasant ones, is a way to engage with music. Gerardo Dirié – Pomegranate Friends: This new work for 4-channel live electronics, saxophone and choir creates an interesting sound world that plays with unconventional tuning systems. Try to experience yourself being inside the sound, and see if you can identify any particular emotions as you listen to the music. If you can, name the emotion. I believe that all of the above can enrich the pleasure of hearing live music and make the experience more interactive. And the next time you are invited to a concert of new (or new to you) music, you can be confident that you’ll find the experience a more rewarding one for having a few basic tools to better appreciate what you’re tasting. I’m interested in your comments: What are some of the things you love about attending live performances? What are some of the things you find challenging? Is there a piece of music which you first heard live in concert that has stayed with you? Happy New Year, musical friends! Welcome to Music Tasting in 2012. I’ve been on a week-long beach holiday recently, which was a delightful way to begin the year. It’s becoming something of a tradition, actually, with a close group of friends. This is now the third year that a few of us have spent the first week of January somewhere in the general proximity of sun, surf and sand. We hire out a not-too-expensive place for the week and pass the days swimming, walking, snoozing, reading, playing cards and board games, watching movies, and cooking our own meals. This year was even hotter than usual so I think we also ate icecream on seven consecutive days (which I do believe is a personal record). Plus we’re all musicians, so usually there’s a fair bit of music chatter, singing and listening to music too. It’s a great way to kickstart the new year. I thought I’d share a song and musical story that takes me back to our first beach holiday as a group. Although we decided to stay in Queensland this year (Rainbow Beach, up near Fraser Island), the past two vacations we’ve headed south instead. 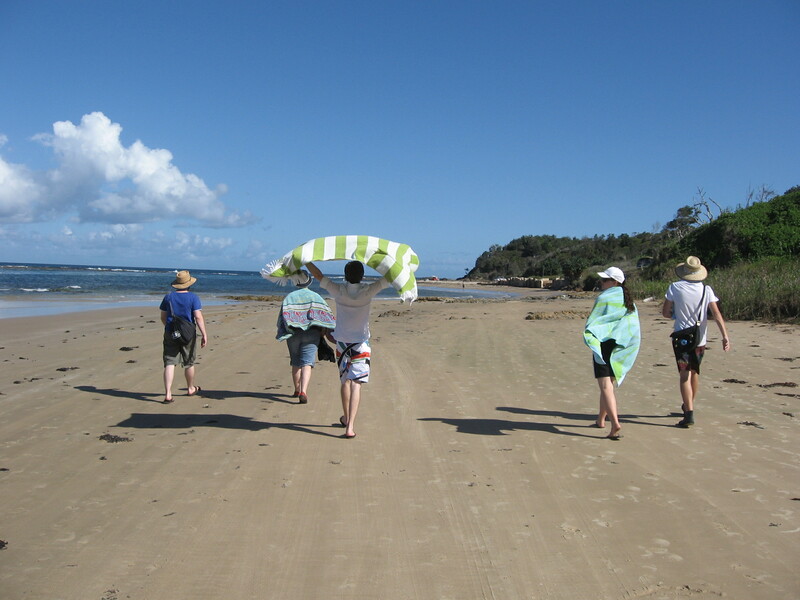 Last year was Brooms Head – or ‘The Broom’ as it is affectionately called – and 2010 was at Wooli, a tiny and remote place on the northern NSW coast, nestled down the bottom of Yuraygir National Park. It fills up during peak tourist season, but it’s a beautiful spot to idle away some days at the beach. That year one of my friends brought a big pile of sheet music with her and we sang through a number of things – just for fun of course, as we choir geeks are prone to do on occasion. One of the pieces was called Gøta (pronounced geu-ta) by Swedish a cappella ensemble The Real Group; I was familiar with the group but not with this particular song. It’s a wordless song, but nonetheless powerful and evocative. It starts out with a simple melody over a drone and builds gradually, with harmonies coming in underneath, the soprano hitting ridiculously high top D’s, and the low bass impressively percussing away four octaves lower. I hasten to add that it’s also a bit of an earworm, and after we’d sung it a few times there was no getting it out of our heads in a hurry! It sort of became our holiday theme song, I guess you could say, the kind of thing that it was easy to default to humming while standing at the barbecue turning the sausages, or sitting on the beach gazing out at the ocean. A long way from Wooli, that’s for sure. But maybe one day I’ll get to spend a summer holiday in the Faroe Islands instead. In the coming weeks and months I look forward to sharing with you some of the plans for Music Tasting during 2012. There are a few things I hope to introduce this year as the site begins to take shape and I give it some more direction. A lot of it is still in the development stage at the moment, but down the track I intend to add a few more features, including ways for readers to contribute their own musical stories and anecdotes. I’ll also begin to branch out into sharing more than just my own favourite music and my own experiences – there’s a whole world out there of people who have so beautifully expressed the power of music in words. One thing is for sure – this is just the beginning! I hope you’ll hang around. It was starting to look as though I wouldn’t get around to adding another post before Christmas, such is this crazy time of year. I know it’s that way for everyone in December, but we had some sad news in my family this past week which has added some emotional strain to what is already a busy and stressful period for most people. But I am posting, because I think for my own sanity I want to share something joyful, and Christmas is usually a time when people come together and stories are born. Probably a lot of people have a family story that begins “I remember this one Christmas when…”, and it might be happy, sad, hilarious or embarrassing. Whatever it is, most people have them. Including me, but what I actually want to share is not really a story of my own but a short tale about the story of a Christmas carol. A few weeks ago I went to the end of year performance of the Brisbane Concert Choir, who sang a musical story called Brother Heinrich’s Christmas, by the well-known English composer John Rutter. I used to have a recording of the story about 15 years ago but I don’t think I’d heard it since, so it was wonderfully nostalgic for me to go and revisit the work. The narrator that night was excellent too. Rutter took the myth about the origin of the carol ‘In dulci jubilo’, and spun his own tale about the monk who is credited with writing it. It’s a delightful story, which features a donkey (played by the bassoon) who sings in the abbey choir and helps Brother Heinrich finish writing the carol just in time for a special service on Christmas Day. Sigismund – which I happen to think is a most excellent name for a donkey – only knows two notes and “they are almost always the wrong ones”, according to the Abbott. But if it weren’t for Sigismund… well… maybe we wouldn’t know the carol today! And finally, because it’s Christmas, I just want to share with you a recording from the recent CD from St John’s Cathedral. This is where I’ll be at midnight tonight, hopefully singing this! Greetings of the season to you, whoever and wherever you are in the world. May it be wonderfully musical and full of shared stories. I’ll return again soon. My day of departure draws nearer and nearer, and not only is my list of things [still to do] growing faster than it is shrinking, but I’m finding that I’m increasingly reflective about all my amazing experiences here and all the things I will miss. My time in Vancouver has certainly been defined by music probably more than anything else. I have heard some of the best choirs in the country, and sung with one of them too. Even fairly ordinary hymns are a joy to sing with the Cathedral choir. But I think my number one performance experience with the choir was singing Rupert’s ‘Kontakion’. It is just so moving, simple without being simplistic, as Tony put it perfectly the other day. The choir’s recording with Bruce doing the solo is just unbelievable. I could listen to it over and over again and not tire of it. The first piece of Rupert’s I ever heard was ‘Agneau de Dieu’ when musica intima did it at a special Evensong in September. I knew then that I had to sing this piece one day so I made a special request to Rupert to include it in a service before I leave, so we’re doing it this Sunday, my last time singing with the choir. On the left there is the congregational refrain for Kontakion – tilt your head and sing along if you like. And the piece where it all began – musica intima remains one of my favourite choirs ever, especially for the way they communicate in performance. Amazing what you can achieve without a conductor, eh?